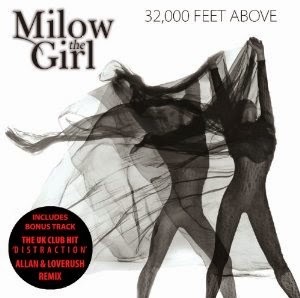 Milow The Girl has released 32,000 Feet Above album. The main core of the album's message is to persevere with things in one's life, no matter what gets in your way. Beautiful World is the first track that will get you rockin'-out, but the song looks at the turmoil in our most unfortunate world, but it shouldn't be because we have many areas of paradise here on Earth. We get into a lo-fi vibe with Contradiction, that begs for you to look at yourself, however seeking affection but seeing no reflection, kind of tells us that we can easily blend into the background to be unseen and irrelevant. The songs that are pop-delicious are Funny Feeling, and singing about love but as a big Distraction, crazy Nights in Vegas, and seeking dreams in the electronic dance track Purple. These crop of songs seem more poignant and trying to gain some navigation in one's life is perfectly illustrated in Lost, and Sad & Wild. Though with Holiday is all about getting away from the confines of everyday stressful living. More strong themed songs keep continuing in Secrets, a soft ballad of strings, and piano. Another rock tune Blinded, though the guitars are more heavy metal in this song about the environmental destruction we are inflicting on our planet. The album doesn't wind-down towards the end with a loose pop-rock song Generation, concerns the aspects of more loving than living in hell in a relationship. Ending-off 32,000 Feet Above is the synth-heavy metal ballad What If (Losing My Mind), which delves into the tortuous and cruel relationships that exists between lovers and partners. There are two Remix versions, the first is Sad & Wild (Ecode), and the second being the UK Club Hit - Distraction (Allan & Loverush).